Do I need a Custom Foot Orthotic? People punish their feet all the time. Long hours on hard surfaces, miles pounding the pavement, and wearing improper or poorly fitting footwear all take a toll. The results are foot pain and debilitating foot conditions such as plantar fasciitis, bunions, heel spurs, neuromas and more. Foot pain leads to dysfunction in other parts of your body as well, including the knees, hips and low back. 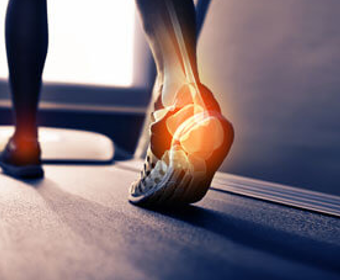 Using the revolutionary Gait Scan technology, the doctor’s at Pro Chiropractic can quickly and effectively analyize your gait and foot function to see if a custom foot orthotic device is right for you. What exactly is a Foot Orthotic? A custom foot orthotic is a device designed to align the foot and ankle into the most anatomically efficient position. They look like insoles, but are biomechanical medical appliances that are custom made by your doctor and a lab to correct your specific foot imbalance. The thermoplastic body of the custom orthotic helps to re-align the foot by redirecting and reducing certain motion that takes place while you walk. Custom orthotics fit into your shoes as comfortably as an insole, and at Pro Chiropractic they have the advantage of having been made from precise digital imprints of your feet using the TOG GaitScan™.